Individual water systems are private wells serving only one single family residence, two residences on the same parcel of property or two residences on separate parcels with a shared well agreement. Public Water Systems are any well or water system that serves more than two residences, even if privately owned. Wells that serve businesses, food service establishments, and bed and breakfasts are also considered public water systems. 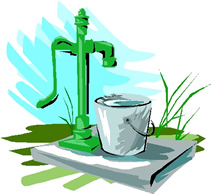 For more information, see our water system chart. There are several different types of public water systems. The size and usage of the system determines whether the system is a Group A or Group B system. Group A systems serve 15 or more connections, or 25 or more people per day for 60 or more days per year. Group B systems serve less than 15 connections and either less than 25 people per day for 60 or more days, or any number or people for less than 60 days per year. Public water systems are regulated by the Washington State Department of Health Division of Drinking Water. The Washington State rules and regulations pertaining to drinking water are available on their website. The rules governing the approval of public water systems are complex. Each new or expanding system is evaluated individually, and requirements vary depending on circumstances. Most often a professional engineer is required to complete the paperwork. For specific details, you may contact Environmental Health. However, we often need to refer questions to the Department of Health. You may contact their Southwest Region Drinking Water Division directly at (360) 236-3030. Most Group A water systems are required to test their water monthly for coliform bacteria, and annually for nitrates. Group B water systems associated with a food service establishment must test their water at least once each year for coliform bacteria, and at least every three years for nitrates. All Group B systems are encouraged to follow the same testing schedule. Additional testing is required if there has been a contamination or other problem with a water system. All public water systems are required to notify the water users if there is a problem with the water supply, such as bacterial contamination. Please visit our page about testing water for more information. The U.S. Environmental Protection Agency has information about public water systems. They also have a searchable database showing compliance violations for each water system and annual Consumer Confidence Reports. The Washington State Department of Health provides purveyor assistance on their website.